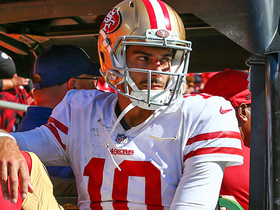 Coach Kyle Shanahan is pleasantly surprised by how fast Garoppolo (knee) has progressed in his rehab from a torn ACL, KNBR Radio's Taylor Wirth reports. 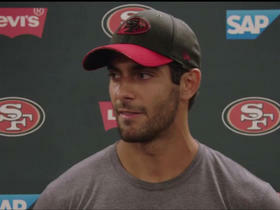 "[Garoppolo] was running around, throwing, doing some stuff out of the pocket," Shanahan said Friday. "I even had to call our trainer and ask 'should he be moving that much?' and he said he should be. It's cool to see." Garoppolo (knee) was recently seen throwing at the 49ers' facility for the first time since suffering a torn ACL on Sept. 23, Chris Biderman of The Sacramento Bee reports. Garoppolo relayed Monday that his rehabilitation from a torn ACL in his left knee is going well, Jennifer Lee Chan of NBC Sports Bay Area reports. "It feels good," Garoppolo said. "Obviously there are some things that we're limited with. The side-to-side lateral stuff is still questionable but I'm happy where I'm at now." Coach Kyle Shanahan said Garoppolo (knee) has a "real good chance" to get some work during OTAs in May and June, Nick Wagoner of ESPN.com reports. Analysis: Garoppolo tore the ACL in his left knee on Sept. 23, underwent surgery on Oct. 3 and had ditched crutches entirely by Nov. 21. After Deshaun Watson suffered a similar injury in practice on Nov. 2, 2017, he progressed to all drills but 11-on-11 team work by mid-June en route to suiting up Week 1 of this season. If Garoppolo does something similar, he'll be on pace for a return in the 2019 regular-season opener, with the pecking order behind him likely Nick Mullens and C.J. Beathard. Garoppolo (knee) was spotted at Wednesday's practice walking about without the assistance of crutches, Jennifer Lee Chan of NBC Sports Bay Area reports. Analysis: It's another milestone for Garoppolo as he works back from Oct. 3 surgery to repair a torn ACL. While Garoppolo has thus far avoided any setbacks as he approaches the two-month mark in his recovery from surgery, the 49ers probably won't have a definitive feel for how healthy he is until reassessing him during OTAs. Garoppolo (knee) was spotted in the 49ers' locker room using only one crutch to move about, Nick Wagoner of ESPN.com reports. Analysis: Since undergoing surgery Oct. 3 to repair the torn ACL in his left knee, Garoppolo had been walking with assistance from two crutches. It only marks a minor step forward in the rehab process, but Garoppolo's comfort with using only one crutch suggests he's progressing as anticipated in the one-month mark in his recovery. The 49ers probably won't have a better idea of Garoppolo's outlook for training camp and/or the start of the regular season until they hold OTAs in the spring. Garoppolo remains on crutches but is closing in on the pool stage of his rehab from a torn ACL in his left knee, Nick Wagoner of ESPN.com reports. Analysis: Recoveries from ACL tears have a vast range of timetables, but the only thing that Garoppolo is certain of is when he'll be able to get off crutches. He's approximately two weeks from reaching that point as he aims to follow in the footsteps of DeShaun Watson this year and be available for the 2019 regular-season opener. While Garoppolo enters the early stages of rehab, the 49ers will continue to put the ball in C.J. Beathard's hands. During Wednesday's surgery, Garoppolo only needed the ACL in his left knee repaired, suggesting his rehab should be "obstacle-free," Ian Rapoport of NFL Network reports. Garoppolo (knee) had surgery Wednesday to repair a torn left ACL, Nick Wagoner of ESPN.com reports. Analysis: Garoppolo had the procedure less than two weeks after suffering the injury, which suggests the swelling in his knee wasn't too severe. He faces a lengthy rehab process, but the timing of the surgery should at least give him a good shot to be ready for Week 1 of the 2019 season. C.J. Beathard is expected to serve as the 49ers' starting quarterback for the remainder of the 2018 campaign. 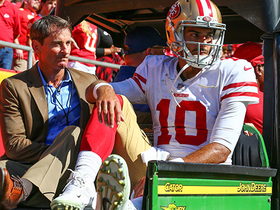 The 49ers placed Garoppolo (knee) on injured reserve Wednesday. Garoppolo is expected to undergo surgery on the torn ACL in his left knee in the next 1-2 weeks, Nick Wagoner of ESPN.com reports. Analysis: Garoppolo will wait until swelling in the region diminishes before undergoing the procedure. Coach Kyle Shanahan mentioned Monday that Garoppolo's injury is believed to be contained to his ACL, but admitted surgery could reveal additional damage, per Matt Barrows of The Athletic. 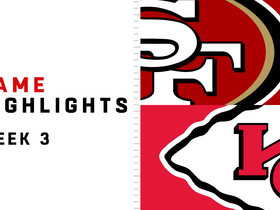 While Garoppolo embarks on a lengthy recovery effort, the 49ers will turn to C.J. Beathard to run the offense. Garoppolo has been diagnosed with a torn ACL, bringing his 2018 season to an early end, Adam Schefter of ESPN reports. Analysis: An MRI confirmed what the 49ers had feared, leaving C.J. Beathard as their new starting quarterback. The silver lining is that Garoppolo went down in September, likely giving him enough time to rehab before Week 1 of 2019. He finishes his brief season with a 59.6 completion percentage and 5:3 TD:INT, but he did produce an impressive mark of 8.1 yards per pass attempt. San Francisco general manager John Lynch told Peter King of NBC Sports that he believes Garoppolo (knee) suffered a torn ACL in Sunday's 38-27 loss to the Chiefs. "All indications are that [Garoppolo's ACL is] torn," Lynch said. "Our [medical] guys say they've been wrong before and so they need to do the MRI, obviously." Garoppolo is slated to undergo an MRI on Monday, but there are fears he suffered a torn ACL, Adam Schefter of ESPN reports. Analysis: If Garoppolo is forced to miss extended time, C.J. Beathard would take over the 49ers' QB duties and the team would no doubt add depth at the position in short order. Prior to his fourth-quarter injury, Garoppolo completed 20 of 30 passes for 251 yards with two touchdowns and no interceptions while adding 23 yards on three rushes and fumbling on three occasions (none lost). Garoppolo was taken to the locker room on a cart with a left knee injury, Adam Schefter of ESPN reports. Analysis: Garoppolo was shaken up on a hit midway through the fourth quarter and slowly walked to the sideline. After an evaluation in the sideline tent, he promptly was carted to the locker room. The injury is worrisome, to say the least, but little will be known until coach Kyle Shanahan makes his obligatory post-game news conference. If Garoppolo misses any time, the 49ers offense will be lead by C.J. Beathard. Garoppolo walked slowly to the sideline during the fourth quarter of Sunday's contest at Kansas City, Cam Inman of The San Jose Mercury News reports. Analysis: On third and goal from the Chiefs' 20-yard-line, Garoppolo tried to keep his legs churning on a 13-yard run but came up on the losing end on a hit from cornerback Steven Nelson. Garoppolo seemed to tell team trainers that his left leg was the area of the injury before entering the sideline tent, per Matt Barrows of The Athletic. If Garoppolo doesn't return, C.J. Beathard will play out the remainder of the game. Garoppolo threw for 206 yards and two touchdowns while completing 18 of 26 pass attempts Sunday against the Lions. He also carried three times for four yards in the 30-27 win. 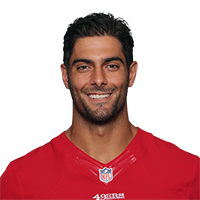 Garoppolo completed 15 of 33 passes for 261 yards with a touchdown and three interceptions in the 49ers' 24-16 loss to the Vikings on Sunday. He also rushed twice for six yards. Garoppolo will sit out of Thursday's preseason finale against the Chargers, Tom Pelissero of NFL.com reports. Analysis: Garoppolo brought an instant spark to the aching 49ers last season and is a lock to be their Week 1 starter, so there's no use in pushing him further. He played in three exhibition contests, completing 22 of 37 passes for 307 yards, one touchdown and one interception. C.J. Beathard will start in his place. Garoppolo completed nine of 19 passes for 135 yards during Saturday's 23-17 preseason loss to the Colts. He also gained eight yards on his only carry. Garoppolo and his fellow healthy starters on offense figure to play up to halftime in Saturday's preseason game against the Colts, the San Jose Mercury News reports. Garoppolo completed 10 of 12 passes for 136 yards with a touchdown and an interception during Saturday's preseason game in Houston. Garoppolo will play at least one series during Saturday's preseason game in Houston, Matt Barrows of The Athletic Bay Area reports. "I see it [his playing time] pretty similar to the first game," coach Kyle Shanahan said Thursday. "We'll feel it out. But he'll probably go a little more. I wouldn't expect much more." Garoppolo completed three of six passes for 36 yards during Thursday's preseason opener against the Cowboys. Analysis: Garoppolo completed passes to three different receivers, but only one of those went for more than nine yards as the first-team offense mustered a short drive before punting. His night was over after that initial series, but there isn't much for the organization's brass to see with the star signal caller. Garoppolo should play more next week against the Texans and will look to make a bigger splash as he inches closer to his first full season with the 49ers. Garoppolo is scheduled to start Thursday's preseason game against Dallas, Nick Wagoner of ESPN.com reports. 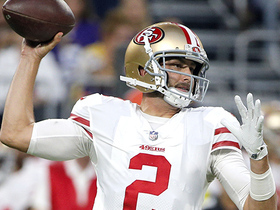 Analysis: 49ers coach Kyle Shanahan said Garoppolo will adhere to the usual pattern for a starting quarterback, playing into the second quarter in the second preseason game and then handling the entire first half in the third game (he'll sit out the preseason finale). While many teams now hold their top quarterback out for the opener, the Niners understandably want Garoppolo to get plenty of live reps in preparation for his first full season as a starter. 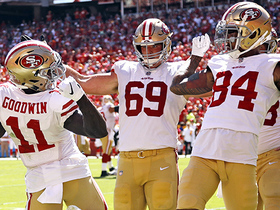 Garoppolo has been building chemistry with a healthy Pierre Garcon (neck) throughout the offseason, Keiana Martin of the 49ers' official website reports. Garoppolo and the 49ers agreed Thursday on a five-year, $137.5 million contract, Mike Garafolo of NFL Network reports. Garoppolo and the 49ers have gained significant momentum in negotiations on a long-term contract extension and could strike a deal in the near future, a source informed Ian Rapoport of NFL Network reports. Garoppolo completed 20 of 33 pass attempts for 292 yards, two touchdowns and a pair of interceptions in Sunday's 34-13 victory over the Rams. Garoppolo completed 21-of-30 passes for 242 yards, two touchdowns and one interception against Jacksonville on Sunday. He added a third touchdown on the ground. Garoppolo completed 31 of 43 pass attempts for 381 yards and one touchdown during Sunday's 25-23 win over the Titans. Garoppolo completed 20 of 33 passes for 334 yards, one touchdown and one interception in Sunday's 26-16 win at Houston. San Francisco head coach Kyle Shanahan has named Garoppolo the starting quarterback for this Sunday's game against the Texans, ESPN's Nick Wagoner reports. Garoppolo completed 26 of 37 pass attempts for 293 yards and one interception in Sunday's 15-14 win over the Bears. He also ran four times for eight yards. Head coach Kyle Shanahan named Garoppolo the 49ers' starting quarterback for Sunday's game at Chicago. 49ers coach Kyle Shanahan said Garoppolo's performance in the waning seconds of Sunday's 24-13 loss to Seattle won't carry any weight in the team's quarterback decision for Week 13 in Chicago, Matt Maiocco of NBC Sports Bay Area reports. Garoppolo completed both of his pass attempts for 18 yards and a touchdown and added a four-yard run during Sunday's 24-13 loss to Seattle. Analysis: Is it Garoppolo time in San Francisco? It looks that way after the trade-acquisition was pushed into action after C.J. Beathard took a rough hit. Garoppolo promptly scrambled around and hit Louis Murphy for a 10-yard score as time expired. Head coach Kyle Shanahan has been very patient with Garoppolo given the complexity of San Francisco's offense, but it'll be tough to keep him out of the lineup even if Beathard is OK given how well he played in very limited opportunities on Sunday. San Francisco head coach Kyle Shanahan said Wednesday that the 49ers are comfortable using their franchise tag on Garoppolo next season, Eric Branch of the San Francisco Chronicle reports. "He does not have to play (this season)," Shanahan said. "It's not that we're coming to this deadline and we've got to decide our future, ours and his, for both sides. We've got six games left and we're going to have next year, also. I know you have to franchise a quarterback to keep him, but quarterbacks are expensive. And that is not that big of a deal to us." The 49ers named C.J. Beathard (thumb) their starting quarterback over Garoppolo for Sunday's game against the Seahawks, Eric Branch of the San Francisco Chronicle reports. Analysis: With the 49ers returning from a bye, it seemed Week 12 was the most likely date for Garoppolo's first start with his new team. Beathard threw a hitch in that timeline, however, when he amassed 288 passing yards and accounted for three touchdowns in a 31-21 win over the Giants in Week 10. It would still be surprising if the 49ers don't start Garoppolo at least once or twice before the end of the season, but it apparently won't happen this Sunday. 49ers coach Kyle Shanahan hasn't decided whether Garoppolo or C.J. Beathard will start Week 12 against the Seahawks, Matt Maiocco of NBC Sports Bay Area reports. Head coach Kyle Shanahan said Friday that C.J. Beathard will start Sunday's contest versus the Giants, ensuring Garoppolo remains a reserve, Nick Wagoner of ESPN.com reports. Analysis: At some point, the 49ers will want to learn about the investment made in Garoppolo, but that day won't come Sunday, at least at the outset of the game. Garoppolo's initial snap with the 49ers will be his first since Week 17 of last season with the Patriots. San Francisco head coach Kyle Shanahan expects C.J. Beathard to start Sunday's game versus the Giants, relegating Garoppolo to backup duties for the second straight week, Eric Branch of the San Francisco Chronicle reports. Garoppolo will be serve as the No. 2 quarterback for Sunday's game against the Cardinals, Cam Inman of The San Jose Mercury News reports. 49ers coach Kyle Shanahan said he can't promise that Garoppolo will play this season, Joe Fann of the team's official website reports. 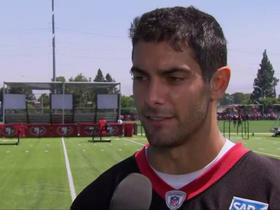 San Francisco 49ers quarterback Jimmy Garoppolo discusses how his ACL rehab is going. 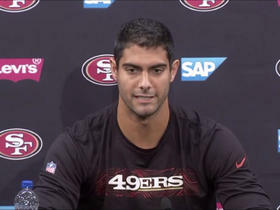 San Francisco 49ers QB Jimmy Garoppolo talks with the media about handling a bigger spotlight, working with his new teammates, and how they want to keep the momentum going from the end of last season. San Francisco 49ers QB Jimmy Garoppolo talks with NFL Network's Steve Wyche about entering his first training camp with the team, about the hype around the team and the competition between O and D.
San Francisco 49ers quarterback Jimmy Garoppolo talks to media about what it's like watching games from the sideline since suffering his ACL injury. NFL Network's David Carr and Willie McGinest discuss the impact that quarterback Jimmy Garoppolo's injury will have on the San Francisco 49ers and their plan moving forward. "The Aftermath" crew discusses what the San Francisco 49ers will do without quarterback Jimmy Garoppolo and whether quarterback C.J. Beathard is ready to step in at quarterback. 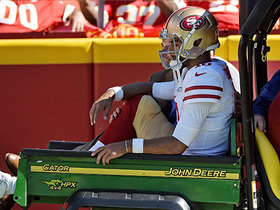 NFL Network Insider Ian Rapoport reports on San Francisco 49ers quarterback Jimmy Garoppolo as he suffered a torn ACL which will end his 2018 season in Week 3. 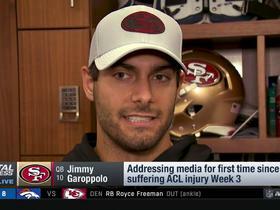 NFL Network Insider Ian Rapoport brings the latest information on the injury to 49ers QB Jimmy Garoppolo. Kansas City Chiefs quarterback Patrick Mahomes sets a record for most TD passes through the first three weeks of the season, and San Francisco 49ers quarterback Jimmy Garoppolo suffers a knee injury during a 38-27 Chiefs' victory.